Finding out what your Social Security benefits are is important not only for you, but for your loved ones as well. Social Security provides 3 major types of insurance coverage, disability coverage, survivor coverage, and retirement benefits. 99% of people focus on the retirement benefits, but the other coverages Social Security provides are extremely important as well. SSA.gov is the official website of the Social Security Administration. Social Security only issues paper statements every 5 years, so if you would like to know what your benefits are you need to register for a my Social Security account. Signing up for an account is a similar process to receiving your yearly annual credit report, it is a bit more intensive than just putting in a user name and password. Social Security needs to validate who you are so they ask a myriad of questions to verify your identity. To sign up for your my Social Security account, go to SSA.gov. We have the most control over our Social Security retirement benefits. The SSA projects this amount on if we continued to earn the exact same amount of money we earned in the previous year, until age 67. In my case, this means my actual benefit will be much less than the number on the screen, as I plan to stop working over 20 years before then. To project your Social Security retirement benefits more accurately to reflect your life plans, it is best to learn their formula and make a spreadsheet detailing your earnings records and your projected benefits. In a nutshell, The SSA looks at 35 years with your highest earnings. If you don’t have earnings in 35 years, then 0s are inputted for those years. The yearly earnings are indexed for inflation and then the sum total of all years adjusted earnings are added together, then divided by 420 months (35 years) to get your Average Indexed Monthly Earnings or AIME. This is the number that determines how much your Social Security benefits will be. Your entire earnings record to date, along with the inflation adjusted earnings are published on your SSA account. Since the PIA is the monthly Social Security benefit you will receive at full retirement age, it is important to ensure that at a minimum your PIA will at least fill the first bend point, and preferably as high as possible into the second bend point. These figures would be represented by lifetime inflation adjusted earnings of $359,520 and $2,165,940. In my opinion reaching an AIME above the second bend point is fairly useless, as the 15% bracket makes a very small percentage in your overall Social Security Benefits. Once you project where you are on course to be, it is possible to make course corrections if needed to maximize your Social Security benefits. 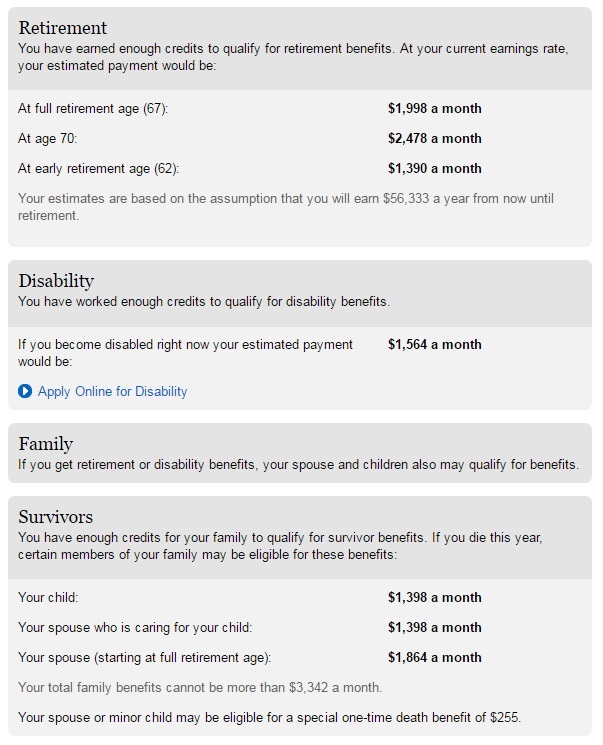 If I were to become disabled right now, I would receive a monthly benefit of $1,564 per month, about half of my families expenses. A 32 year old man is 6.5X more likely to become disabled than to die, so disability insurance is extremely important. While $1,564 per month would certainly be helpful it is not enough to pay our bills, much less achieve our long term goals of paying off the house and building wealth. Since Social Security coverage is not adequate, from my Social Security statement I know I should take action to secure more long term disability insurance. This represents roughly 30% of my earnings on a yearly basis. If my employer offered Long Term Disability Insurance I would buy it in a heart beat. Most employers offer long term disability insurance at group rates, which are far cheaper than rates for plans on the open market. As an example, one of my contract employers offers full time employees 60% income replacement long term disability insurance at a cost of 34 cents per $100 earned. For someone earning $60,000 a year, this would be $204 per year, for a yearly benefit of $36,000 or $3,000 per month. Be aware that any disability insurance payments received from an employer plan will be subject to income tax. The next option is to buy a plan on the open market. Zander Insurance has a calculator on their website which will give you anonymous quotes. For the same policy outlined above, I would pay around $800 per year. Although this is fairly expensive, it is still a really good deal. This is a quote for the most conservative plan available, offering 60% income replacement until age 65. Long term disability insurance can also be purchased in lower multiples of your income and for 5 or 10 year terms. Survivor benefits are benefits paid to my children under the age of 18 and to my spouse who is caring for them. My qualifying children would be my step son and my biological son. Although we have guardianship of our nephews, they would not receive Social Security survivor benefits from me. My children would each receive $1,398 per month and my spouse caring for them would receive $1,398 per month, with a maximum family benefit of $3,342. This would cover their living expenses, but wouldn’t leave much room for savings. Mrs. C. would receive the maximum of $3,342 for 5 years, followed by $2,796 per month for 5 years after that (our kids have a 5 year age gap). In total, this would be just over $350,000 in benefits. I know that I want to provide Mrs. C. and my kids with more resources if I were to die. When my son was born I purchased a $500,000 20 year term policy for around $20 per month. Term life insurance is extremely cheap, and EVERY parent should have term life insurance as a way to ensure their children will be properly taken care of in their absence. This $500,000 policy combined with Social Security should be plenty, however because of how incredibly cheap life insurance is, I may pick up another $250,000 policy. As someone who is raising 2 children who lost their mother, I can tell you how truly important life insurance is. No amount of money could ever make up for the fact that these boys don’t have their mother to tuck them in at night, to read them a story, or to take care of them when they are sick, but we don’t get to make those deals, and having even a small policy would make a world of difference in raising these kids. In general Social Security benefits do not provide enough of a survivor benefit so grabbing a term life policy should be at the top of everyone’s to do list. 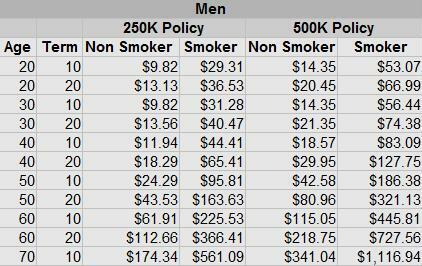 A $250,000 10 year policy for most healthy adults would run around $10 per month. Here’s a chart I made a while back comparing life insurance costs. The Social Security death benefit is 3 times the PIA OR $255, whichever is LESS. The benefit is payable upon the death of the insured person to help with final expenses. Since even a low budget funeral service will run around $4,000, this amounts to around 5% of the total. The rationale for this benefit and it’s level doesn’t make much sense to me, as the $255 figure has been frozen since 1954. If it adjusted for inflation, it would be $2,281 in 2016. Although it doesn’t cover much, an extra $255 does make a dent in final costs and is worth pursuing. This benefit is only payable to a spouse living with the insured person at the time of his death, or a spouse or child who is receiving benefits off of the workers record. It’s entirely possible for errors to be reported in your Social Security earnings history. In general, you only have 3 years, 3 months, and 15 days from the end of the tax year in question to report errors to get them fixed, which is another reason to be vigilant of your Social Security Benefits and to sign up at SSA.gov. Have you signed up for an account on SSA.gov? For more information on maximizing your Social Security benefits, check out Get What’s Yours, The Secrets to Maxing Out Your Social Security .